Phew! This week kind of got away from me! But I did find bits of time to get these Liberty squares sewn together. I’ve collected little pieces of Liberty for a very long time now and finally decided it was time to get them sewn into a quilt. I was thinking I’d have enough for a nice large throw size, but as it turns out, this ended up nearly a perfect queen sized quilt. Which is awesome, except for the fact that our new king sized mattress is being delivered today. 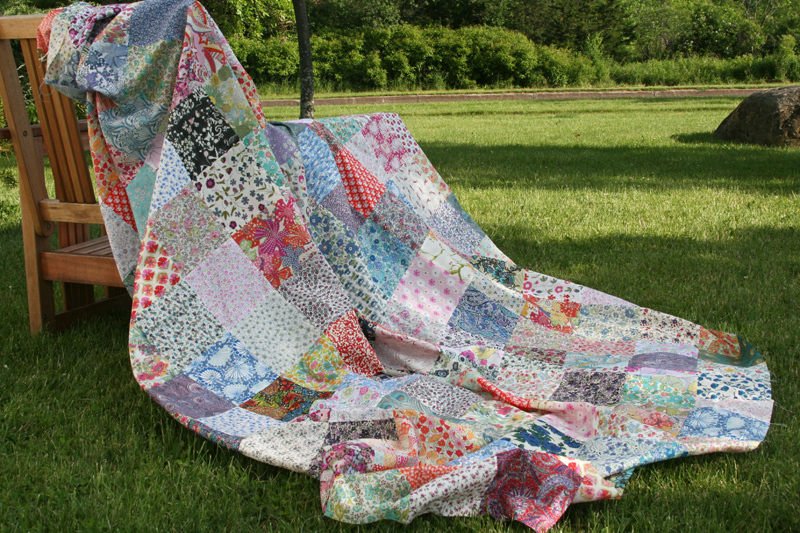 So, dilemma… buy more Liberty and add to it to turn it into a king sized quilt, keep it at a queen for the guest bed, or cut it down to a large throw? I still can’t decide, but I do know that I absolutely love it. And I think Max might be a fan as well. Looking for some Liberty? Jo at the Organic Stitch Company (where many of these prints came from!) is having a sale! Use discount code restock30 for 30% off anything in her shop! This entry was posted in Fabric, Posts about Quilts and tagged Fabric, handmade, liberty, liberty of london, patchwork, patchwork squares, quilt, quilt top. Bookmark the permalink. 49 Responses to liberty patchwork! so so pretty! love that max is playing with it. 🙂 i’d say get more and make it a king!! Gorgeous. I say guest bed, so you won’t ever get sick of it and it can stay there forever. i would love it as a THROW!! It would get lots of use and be seen alot. i absolutely love this! 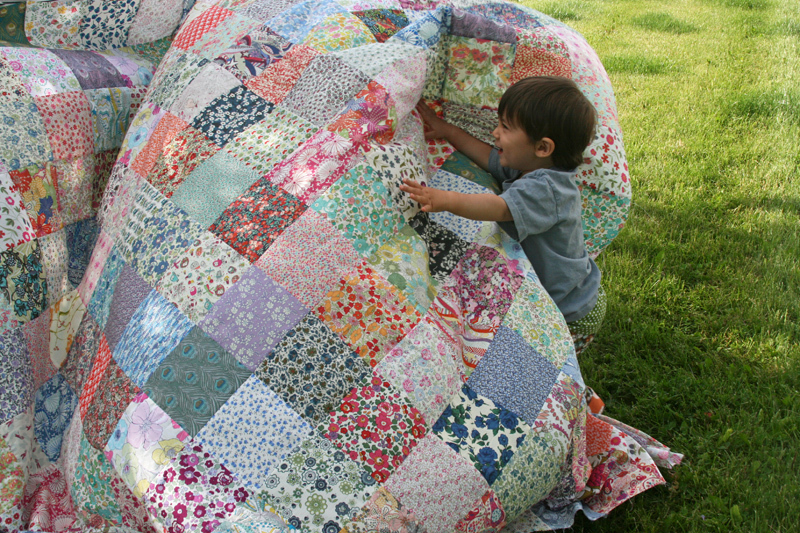 and a beautiful picnic blanket as weel. Oh No! You can’t cut it : ) It’s so pretty, the bigger the better. It is so beautiful! I think you should get more and make it a king. If you have been hording fabric for that long you should enjoy it every day! Nothing is better than stitching with Liberty fabric. Your quilt is beautiful! I think you should add to the quilt and put it on your bed. You deserve that after all the collecting you did for the quilt. It’s absolutely gorgeous!!! Make it a king if it would go well in your room, and it makes you happy! A good excuse to buy more Liberty! If not, leave it as is. It gorgeous! Seeing your photo on the grass, I think it looks like a great picnic quilt! Well of course you should get more Liberty! I admit, I haven’t fallen onto that bandwagon (yet), but if it’s what you love, it should be for your bed. Whatever you do – don’t cut it! It’s too beautiful for that. Add more squares! I just finished a king size quilt in liberty with alternating blocks of cream, Irish chain I think it was called. I can send you extra pieces! I have quite a bit left over. Go king! 🙂 Fabric.com has Liberty on sale right now, plus Organic Stitch Co. on etsy has her Liberty 30% off as well. Perfect time to buy more! I also recently started collecting little bits of Liberty and am planning my own, can’t wait to get stitching. And your little boy is such a cutie! Oh, queen or king for sure. It would be a crime to cut it down. It is gorgeous as is Max. AHHHHHH! Don’t cut it! Make it bigger! It absolutely needs to be a king. Its just stunning, and I’m excited to see how you are going to quilt it. This is one of my favorite quilts of yours for sure! I say leave it as is, because if you’re like me, it’ll get put on a shelf and turn into a UFO otherwise LOL. I’m also loving that armadillo shirt! Your blog says you’re in New England. How does a southern armadillo make it up to that part of the country? I grew up in S. Louisiana, now live in Oregon, and kind of miss those critters… Beautiful quilt BTW! It’s so fun to see pictures of Max. I have three boys (22, 20, and 15), well past the cute stage, and I miss their chubby little bodies and sticky kisses. 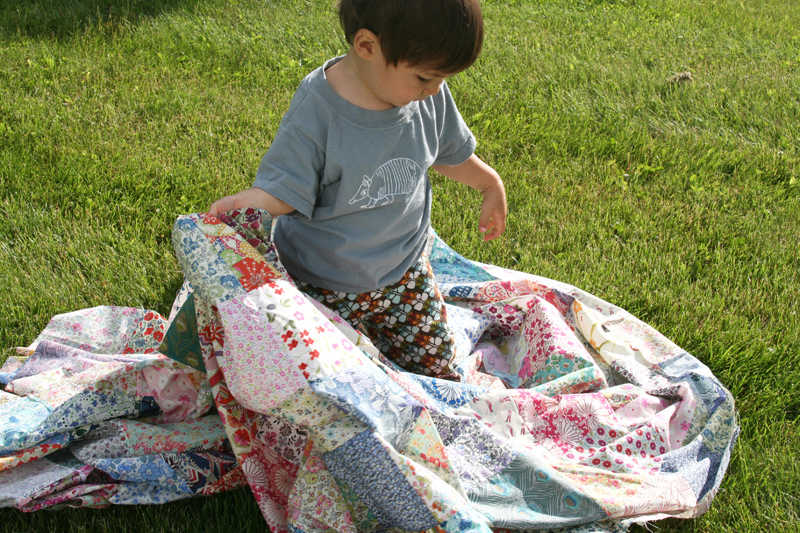 Luv your quilt … what size squares did you cut? 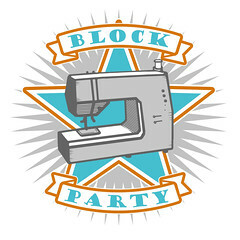 My SIL wants one just like this in another fabric line. I say get more Liberty and make it a King! You can never have too much Liberty! You gotta go for the King. All that work and pretty fabric? You deserve to enjoy that on your new bed. I think you should go for it and make it a king! Especially if Fabric.com is having a sale on Liberty! King, definitely! I know if I put it in the guest room, I’d just be looking longingly at it all the time. Obviously a boy with good taste! I vote make it for your bed. I just made my first quilt out of voile and there is nothing softer or lighter to sleep under in the warm weather–you’ll love it! You’re raising that boy to have good taste! This is so beautiful, don’t cut it down, you’ve put all this effort into it and it will be worth is to make it bigger to fit your new king-sized bed. be still my heart!!! it is so gorgeous!!! go for a king – i don’t think you’ll be sorry to have that on your bed!! LOVE this!! 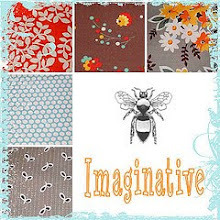 And I’m not trying to be an enabler (it just comes naturally) – but I stopped at Liberty last week while I was on vacation and I got a few more prints…so I could easily send you a few more squares if you want to make it bigger! Just let me know! Beautiful! I’d vote to enlarge it to king size. you’re almost there! NEITHER! I have a queen bed, and I buy full sized quilts for it, NOW, because queen sized ends up almost on the floor. SO, a queen quilt for a king bed, to me, is just right. I’ve even thought of going even smaller for my bed, and having it be a square on the top, right up to the edges, on top of my white bedspread in the summmer, and white matlasse quilt in winter. At any rate, TRY IT on your new king bed, before you do anything, like cutting!!!!!!!!!! How happy I would be to sleep in a guest bed with a quilt that beautiful and warm! Looks lovely, I am sure it feels even better. So simple yet so fabulous. Ooooh, I vote for bigger (because it’s better, right?). I mean, bigger bigger bigger… But it’s beautiful as is, so I’m sure whichever size you pick will be GREAT! Total gorgeousness – whatever you decide! what a wonderful way to welcome guests! who wouldn’t feel special sleeping under this patchwork. we are loving our king-sized liberty quilt. it is the perfect weight for summer. so i say go for it! buy more!